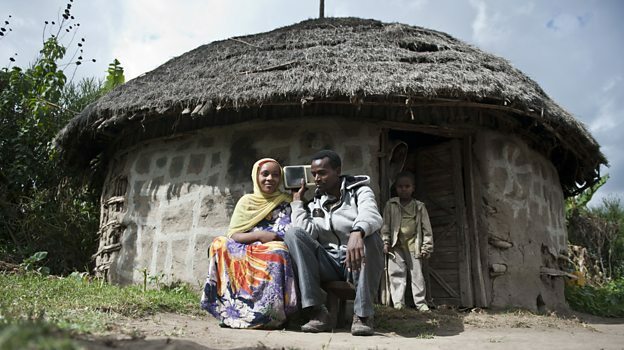 Watch: how our teams are using radio to improve family health in rural parts of Ethiopia. BBC Media Action has been working in Ethiopia since 2001, strengthening local media capacity and fostering long-term positive change. Since April 2013, we have been producing two radio shows - Jember and Biiftuu Jireenya - to encourage better reproductive, maternal, neonatal and child health. Other programmes using radio help raise awareness about indoor air pollution - and improving resilience to extreme weather. Previous work has included: Abugida, a radio programme for young people that helped break the silence around sexual health; Catalysing the Girl Effect, a series of community screenings of documentary films following inspiring young women; and Filega, a radio drama which covered livelihoods and HIV issues. Radio programmes and mobile phone services are improving farmers’ access to accurate weather information in Ethiopia. Radio programmes Biiftuu Jireenyaa and Jember deliver life-saving information to women and their families. From 2006 to 2010, a pioneering radio programme for young people helped to break the silence about sexual health issues in Ethiopia by bringing taboo subjects to the fore. Air We Breathe is a health-focused project in the Oromia region of Ethiopia addressing indoor air pollution through radio and public service announcements. Our radio programmes in Ethiopia give pregnant women and their families valuable health information. Halina Assefa describes why the programmes are underpinned by rigorous health research. Volunteers gain new, valuable knowledge about maternal and child health.